Addressing climate change must be seen as an adaptive challenge with practical, political and personal dimensions. O´Brien discusses what it would really take to bend CO2 emission curves. She argues that current roadmaps and pathways for decarbonization are far from having the potential to meet the Paris Agreement on climate change, rather they are likely to lead to a dead end, as they primarily focus on technical, managerial and behavioral changes. By using the Three Spheres of Transformation framework, O´Brien suggests that there are other far more effective leverage points for system change, highlighting the critical role of people as subjects or agents of change. The article “Is the 1.5°C target possible? 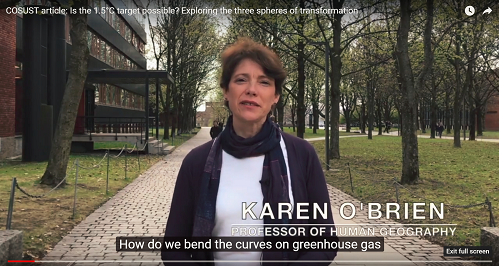 Exploring the three spheres of transformation” is open source and can be downloaded from the COSUST website here. It is part of a special issue series of the Current Opinion in Environmental Sustainability (COSUST, Volume 31, April 2018) featuring contributions from different perspectives on 1.5°C climate change research and social transformation to support the IPCC Special Report. Linda Sygna and Bronwyn Hayward were guest editors to this issue.